இட்லி, வடை, சாம்பார், சட்னி, கொஞ்சம் இங்கே வாடா …… Oh!!! Oh!!! Guys don’t get confused why I am writing a Hindi Movie review in Tamil. There are words used by Shahrukh Khan in the movie. In the movie he acts as a Software Engineer from Tamilnadu called Shekar Subramaniam. He is settled in London with Family and works in a Gaming software company. Just for his son, he creates a game where the villain is more powerful than the hero(the game hero looks like him). The villain from the game come out of the game into reality trying to kill Shahrukh’s Son. The hero too comes out to kill the villain and save the boy. This is the crux of the story. I have read few reviews before I went to see the movie. They were really pathetic and I was wondering if it is worth watching the theatre. I had to watch it for the sake of my son. But the movie was not as bad as I thought. It is worth a one time watch. I was bit irritated when they started teasing Tamil people. There is a saying “When someone teases you for something then it means that they are jealous of you for having it”. Shahrukh being the hero has the same mannerism that we have seen in most of the movies. Even though in the movie he acts as a person from Tamilnadu he does not look or behave like that. The heroine is Kareena Kapoor, she has a small role and have played the role very neatly. The small boy does not look like a Indian boy, he is more Londonized . The graphics and the stunts are not so good. we have seen much better graphics and stunts in Robot. 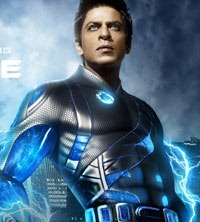 The Super hero does not stay in our heart but worth a watching onetime. Kids will like it.